A year ago, Montana won two of its final three non-conference games before opening Big Sky play at Northern Arizona and Southern Utah. The Grizzlies were dominant in both road contests, setting the course for a 13-0 start to league play and a Big Sky Conference title. This year, Montana also won two of its final three non-conference games and this week will again open Big Sky play at Northern Arizona and Southern Utah. The results and the trajectory of the next several weeks is still to be seen, but Montana is seemingly beginning to peak at the right time. For one, Montana is beginning to get back to full strength. The Grizzlies have had their full roster available just once this season, but starting forward Jamar Akoh has started three of the past four games. Perhaps bigger, Montana has momentum. During the month of December, opponents are averaging just 60.0 points against Montana’s defense. On the flip side, the Grizzlies scored 85 points in their most-recent game – their biggest win of the season – snapping South Dakota State’s nation-leading 26-game home winning streak. Montana’s seven non-conference victories led the Big Sky. The team’s 7-4 record was its best since 2010-11, doing so against the 43rd-toughest strength of schedule nationally. Montana knows it will have to be at its best night in and night out, though. Over the next 20 games, the target will be on the Grizzlies’ back each night. Montana was the unanimous favorite to win the Big Sky Conference and make a return trip to the NCAA tournament. The Grizzlies will kick off Big Sky play at Northern Arizona, a team that has lost seven consecutive games overall. Tipoff is slated for 2 p.m. MT Saturday and can be watched on Pluto TV. Enters Big Sky play with a 2-8 record overall, losing seven in a row dating back to its Nov. 14 win at Omaha. The Lumberjacks are playing at home for just the third time this season, beating Jacksonville (Nov. 10) and losing to Utah Valley (Dec. 8). NAU has four players averaging double figures for scoring, led by sophomore Carlos Hines (13.0) and transfer Bernie Andre (12.7). Hines leads NAU for three-pointers and steals, while Andre is the team’s leading rebounder (12th in Big Sky). Freshman Luke Avdalovic leads the Big Sky with a .571 three-point field-goal percentage. He is averaging 2.2 made threes per game. The Lumberjacks have three players rank in the top 15 in the Big Sky for free-throw percentage. NAU’s best statistical category is steals, ranking fifth in the Big Sky with 6.4 per game. Hines ranks sixth in the league with 1.6 per game. NAU ranks 300th or worse nationally for scoring defense, field-goal defense, rebounding margin and turnover margin. Under Jack Murphy, NAU went 5-27 in 2017-18, finishing last in the Big Sky (2-16). In a series that dates back to 1970-71, the Griz and Lumberjacks have played 101 times. Montana holds a 69-32 edge, including a 7-0 record under Travis DeCuire. In fact, over the past 10 seasons, Montana is 17-3 against the Lumberjacks. 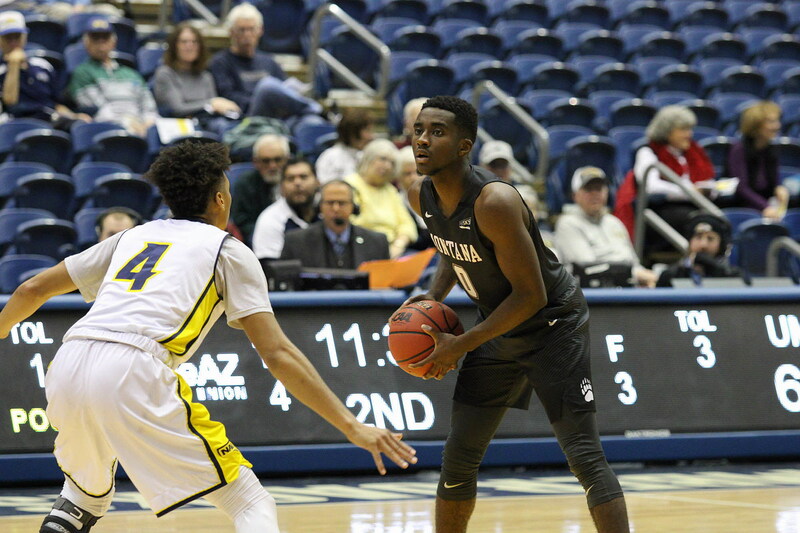 A year ago in Flagstaff, Jamar Akoh had a double-double with 23 points and 10 rebounds, as the Griz limited NAU to 32.7 percent shooting and forced the Lumberjacks into 19 turnovers. Akoh had17 points in the meeting in Missoula. In five career games vs. NAU, Michael Oguine is averaging 15.4 points. Montana’s 7-4 non-conference record was its best since 2010-11, and came against the nation’s 43rd-toughest schedule. Montana is 7-4 despite having its full roster available for just one game all season. Most notable, starting forward Jamar Akoh has missed seven games. The Grizzlies are allowing just 60.0 points per game over the past five contests. Montana is shooting .480 on the season (54th in NCAA, 1st in Big Sky) and has made at least half of its shots in six games. Montana has made at least eight three-pointers seven times this season. The Grizzlies hit that number just four times in 2017-18. Five different players have led Montana for scoring. Four players are averaging at least 12.0 points per game. The Griz are coming off of their two-best nights from the charity stripe, connecting on 77.1 percent of their free-throw attempts at Arizona and South Dakota State. Just four players all season have made more than five field goals against the Griz. Montana’s four losses have come to opponents with a combined record of 37-15 (.706). After being one of two teams to use the same starting lineup for every game in 2017-18, the Grizzlies have used four different combinations in 2018-19. After posting a +4.6 rebounding margin (47th in NCAA) in 2017-18, Montana has been out-rebounded seven times this season. While Montana’s 31.2 rebounding average is last in the Big Sky, the Grizzlies rank second by allowing just 33.2 rebounds per game. They also rank in the upper third of the conference for scoring defense, blocked shots and steals.